PITTSBURGH, Pa. - Sidney Crosby is returning to new linemates and a new role with the NHL's hottest team. But Pittsburgh Penguins coach Dan Bylsma still expects to see the Crosby of old despite his current 40-game layoff and the 102 games the star forward has missed over two seasons because of concussion-related issues. Crosby, out since Dec. 5, announced Tuesday he will play Thursday night against the Rangers in New York. The Penguins, riding a nine-game winning streak, are four points behind New York in the race to be the top-seeded Eastern Conference team in the playoffs. What already was a marquee game for the NHL just got even bigger. Much bigger. "I think it’s unrealistic that he’s going to step into Madison Square Garden and be the only show on the ice," Bylsma said. "But I know how the guy plays. I know how fast he is going to go. I know what’s going to happen when he has the puck with speed. You know how he’s going to be able to play down low with the puck, and you expect to see that player step on the ice. That’s a really good hockey player. That’s the best hockey player in the world." Penguins centre Evgeni Malkin arguably has been that player with Crosby out, piling up a league-high 84 points. Now, Crosby is coming back at a key point in the season, with 14 games remaining for Pittsburgh and the playoff race still undecided. "I know Geno is excited to be on the same ice with Sid again," Bylsma said of Malkin. "I still think it’s a great challenge for our team. We’re not a shoo-in to be a really good team when they all come back." Crosby admittedly feels better than he did when he returned nearly four months ago after missing the final 41 games of last season and the first 20 games this season. He dazzled the New York Islanders with a two-goal, four point night on Nov. 21, but he didn’t have another goal in the other seven games he played before the concussion symptoms returned following a physical Dec. 5 game against Boston. This time, general manager Ray Shero said, "He feels better than last time and knows what to expect this time." "I probably feel a little bit better just knowing what to expect," Crosby said. "I think it’s easier going through it this time. I know what to expect. That first game was pretty overwhelming. It was a lot of fun, but that being said I’ll take it more in stride this time and make sure I’m getting better with every game." After being cleared for contact last week, Crosby weighed whether to return Sunday against the Bruins, only to decide that he hadn’t had enough contact to play in a game so late in the regular season. Defenceman Kris Letang, a key to the Penguins’ much-improved power play, also could play Thursday. He has missed five games with concussion-like symptoms, but was cleared to practice Tuesday. "As a player you definitely get excited when you see guys starting to come back," defenceman Paul Martin said. "You definitely get a good feeling." Crosby got plenty of work Tuesday, skating on the third line with Matt Cooke and Tyler Kennedy and playing the point on the power play. Moving Crosby, an expert passer, to the point allows Malkin to remain on the half-wall, where he has been effective. For now, Bylsma plans to keep intact his productive top two lines of Chris Kunitz-Malkin-James Neal and Steve Sullivan-Jordan Staal-Pascal Dupuis. Still, Bylsma also plans to put Crosby and Malkin together at times and also slot Crosby and Staal together, a unit previously unseen. "I’m pretty sure I’ll end up with them (Cooke and Kennedy)," Crosby said. "I wouldn’t see coach putting me with a different pairing after missing this much time. I’m sure he’s trying to get guys used to playing with one another. In any game, different line combinations are common, but for the most part that’s who I’ll be with." During a layoff that saw multiple visits to specialists other than those who have been treating him in Pittsburgh, Crosby was diagnosed with a soft tissue injury in his neck. Crosby believes this diagnosis, and the subsequent treatment, helped get him back on the ice again. The concussion issues have left the NHL without its best-known player for all but eight games in the last 15 months. 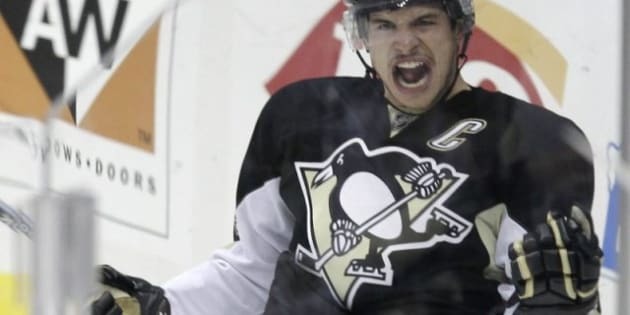 Crosby was enjoying the best season of his already exceptional career in 2010-11, with 32 goals and 66 points in 41 games, until hard hits in successive games Jan. 1 and 5, 2011, sidelined him for the rest of the season. Without Crosby, the Penguins had a 106-point season but were eliminated by Tampa Bay in the first round of the playoffs. Crosby would have as many as 14 regular-season games remaining before the playoffs if he gets through the rest of the schedule without any further problems. Initially, Bylsma plans to limit Crosby to 14-15 minutes a game, although he knows that could prove difficult. "You don’t pace Sidney Crosby," he said. — With files from Chris Johnston in Boca Raton, Fla.